With the game’s officially launching this July 9, I thought it could be helpful to provide a few tips to get you started! Especially since you can already create an account and start playing right now if you want to! 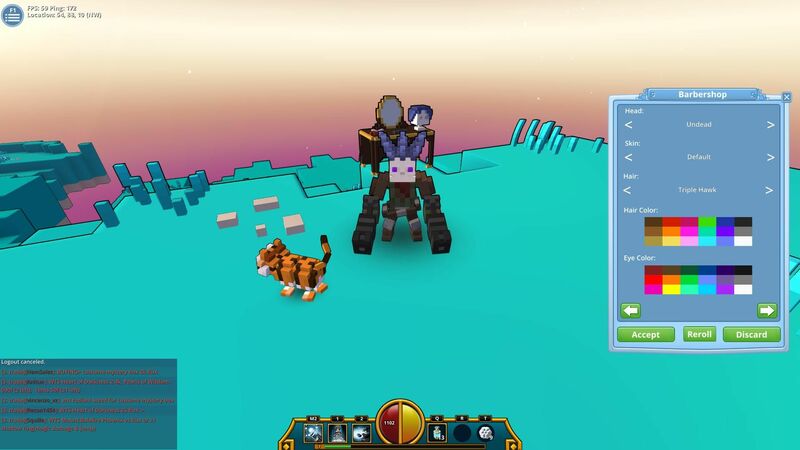 In general, Trove isn’t a very complicated game and the tutorial explains a lot already. But as with every new game, some things can be confusing or unclear in the beginning. Speaking of different classes: Equipment stays equipped with the class when switching to a different one. So, that really great sword on your Knight can only be found when switching to the Knight. If you want to use it with another class, you have to unequip it first. There is no “binding” of equipment, though, so unequipping something from a character is done with just a single click and you can even trade the item to somebody else if you want. 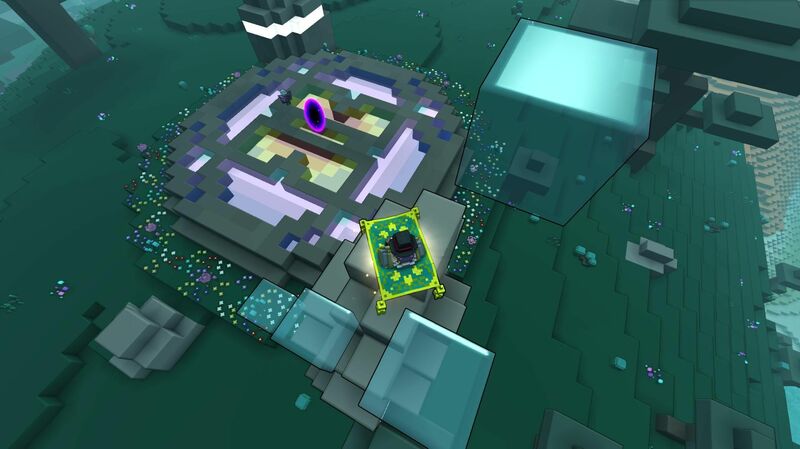 One thing I worried about when I first tried out was Trove was my cornerstone. I had placed it somewhere in the world where it had looked nice, but then realized that I would probably not find it again when I had left it to explore the surroundings. However, your cornerstone is not put on a static place. It moves with you and you can “call” it whenever you see a free cornerstone base. Just click on the sign with the question mark and your cornerstone will appear! If you’re wondering why you should even bother about the cornerstone: When you placed it in the world and then you die, you get resurrected there instead of at the spawning point of that world. So, placing it near you every now and then isn’t a bad idea. Also, you can place a lot of useful items in there like the Loot Collector that lets you deconstruct items to get materials. You can join up to 5 clubs. Clubs are like guilds in MMOs. You can only represent one club at a time (the club name appears behind your name), but you can read and write in all your clubs’ chats and access all of your clubs’ worlds. If you’re just starting out and plan to have a little club with just a few friends, you can certainly do so. At the same time, having this little club and finding an already established club that lets you use all the convenience items (crafting stations, portals and so on), are not mutually exclusive! When you log into the game, you will see a big Welcome screen. This one also shows you which bonus is active on which weekday. If you’re a casual player who doesn’t get or want to play that often, use those bonuses accordingly. E.g., wait for Mondays to harvest things you planted in your garden as you will get more loot harvested this way. On Wednesdays, you get extra glim from adventuring. This is the glim you get from riding through grass with your mount, for example. I personally try to do my daily (doing dungeons for extra cubits) in the Fae Forest regions as they sometimes have dungeons with an abundance of glim around them. I just ride through it all and then do the dungeon. Often times, I find myself getting distracted when roaming the map to find dungeons. All that ore! I need to have it! But seriously, I have hardly ever run out of Shapestone (the purple ones) so far. Infinium, however, is quite different. 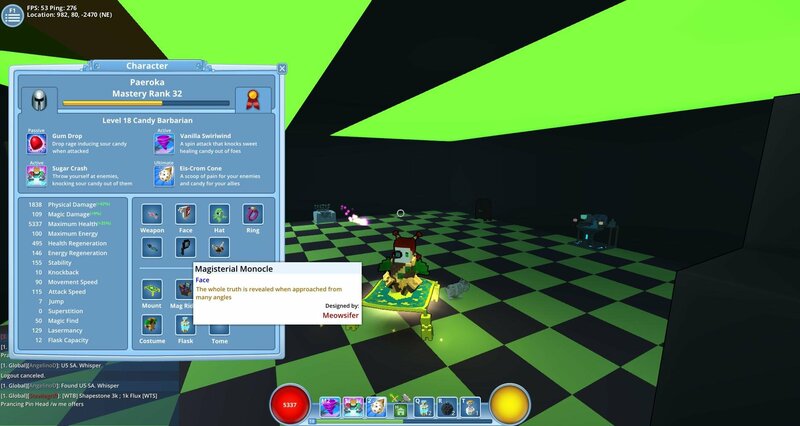 Most of the time when something I wanted to craft required Infinium, I had to go get some. And this seems to be the general rule: When you need something, it definitely won’t be anywhere to find. 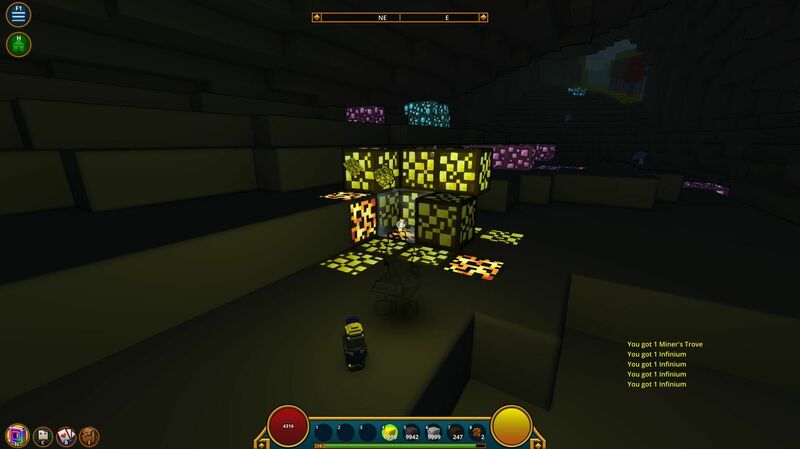 So my advice to you would be to not get distracted and harvest all the ore when you’re actually on your way to do something else, but as soon as you see Infinium, make an exception and grab it! And speaking of grabbing: There is no stealing from others! Everybody close to you has a chance of getting loot when you kill a mob. Everything you harvest (plants, glim, ore) goes to their inventory as well – that is, both of you get the same amount of loot each! And everybody gets XP for killing mobs. On the downside, this can lead to people following you around and not doing anything, but I have hardly ever had that happen. In most cases, the other players and I fought together and mined together peacefully and happily. One word of advice for when you want to afk: Don’t do so in seemingly save spaces. Every now and then, a Shadow Invader will spawn randomly and it has only one target: You. These mobs drop from the sky, by the way (and in my personal experience, they tend to do so exactly in that moment when you decide to quickly go grab a coffee in the kitchen or open the door for the mail). You can usually hear them arrive, though, because they make quite some noise when they spawn. When it comes to storage space, there are four different kinds of chests. One is the Personal Chest. As the name suggests, this is only for you! Nobody else has access to your storage. 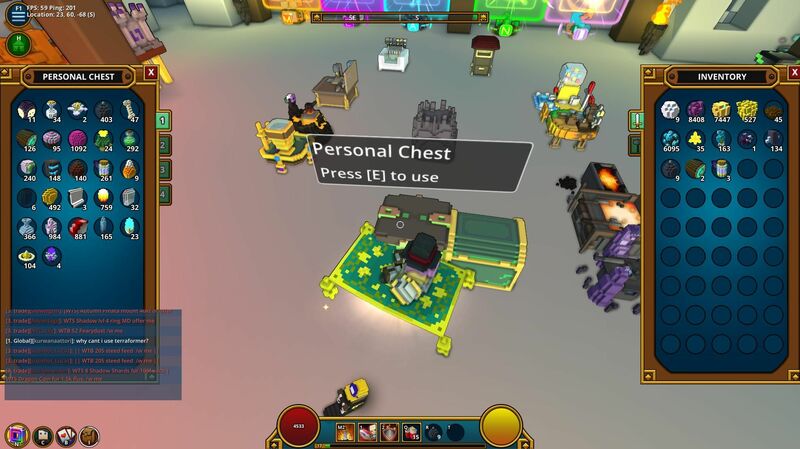 When another player clicks on a Personal Chest, they will only have access to their own stored items. The Club Chest and the Club Officer Chest are for fellow club members and/or officers. So be careful when placing items in there. Again, only those belonging to your club will have access to those stored items. Last but not least, there is the Community Chest. This one lets every single player access the same storage. So only put something in there if you want to donate it to whoever accesses the chest next and decides to take it. This chest is not for trading items. Use the Trading Post to do so. Last, but probably not least, a rather new addition to the game are the “Challenges“. You can only participate when you have reached mastery level 30+, so this isn’t exactly a tip for beginners. But when a challenge is active, it lists classes that get a “bonus”. A challenge asks you to complete dungeons in a specific biome. When you do that with a class listed with a “bonus”, your count goes up by 3 for each dungeon completed instead of only 1. If you want to know more about challenges, read this guide on Waiting for Rez. (Update July 16, 2015) – The price for a class changes over time from 8000 to eventually 5000 cubits. When it gets added to the game, it will be the most expensive one (8000 cubits). Once a new class gets added, the price will drop to 6500 cubits. Once two new classes have been added, it drops to the minimum price of 5000 cubits. So, if you’re low on cubits and can’t decide which class to unlock next, opt for the cheapest ones first. The newer ones will get cheaper one day. Each class will always be 1050 credits if you choose to pay with credits instead. Really good guide. It’s easy to forget some of these things when you’ve been playing for a while but there are a lot of “curious” features when you’re starting out that can be confusing. 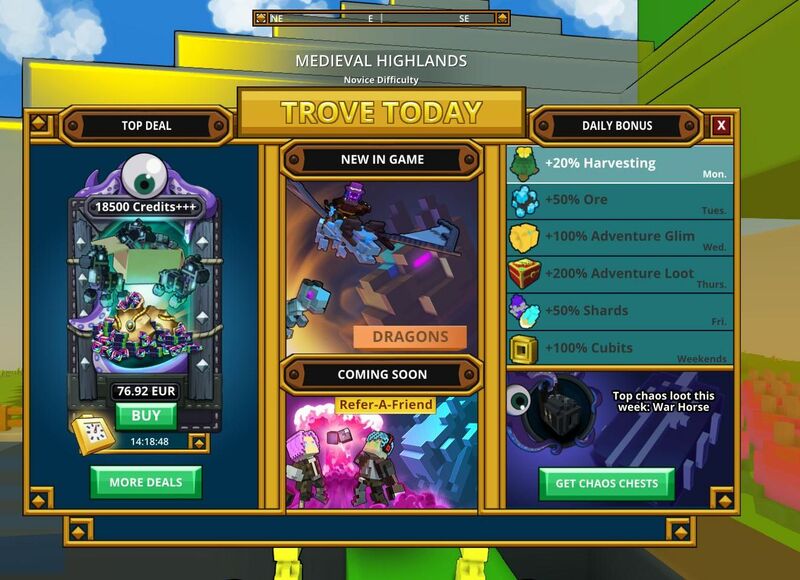 I find Trove to be similar to several different genres but not exactly like any of them which means for the new player you can’t really rely on familiar MMO tropes to navigate through the early stages. One thing I wanted to add is that once you start leveling ringcrafting in the higher tiers you will go through shapestone rapidly so at some point even it may require a little farming. Also, infinium is easier to find in some biomes than others and I think it’s more common in the higher Uber zones (not certain, just anecdotal). I’ve found it most frequently in caves within the frontier deserts and Candoria biomes. I always have a few bombs crafted and ready so that when I see some infinium I can throw a couple to gather it quickly. The bombs are a great tip! I usually just put them in my personal storage and forget about them, but it’s so much faster to mine Infinium that way. I did not include where I think Infinium spawns more, because I used to farm it in Dragonfire Peaks and I haven’t seen any Infinium at all there recently. On the other hand, I think they increased the spawn rate with one of the last patches, because I’ve seen more Infinium again lately. All of this could just be my own impressions, though, and as you mentioned, spawn rates are also (probably) different for the various levels. Just wanted to say thanks for these tips. I finally got around to giving Trove a try and these helped me out. I have one dumb question though, if you don’t mind. Is there any way to open those chests that appear when a dungeon boss dies that doesn’t involve attacking it? I thought it would be something logical like pressing E to open it just like using any other object in your cornerstone. But the only thing I found to work to get those chests to drop their contents has to be attacking them! I believe, and this is just a theory, that the chests open after a certain number of hits rather than damage. So the higher attack speeds of melee and ranged channels (Dracolyte, Tomb Raiser) will open it faster than slower, heavier strikes. It IS the number of hits that count or else if u ended upp going in u5 with a newbie class it would take YEARS to open it if it depended on the damage did to it. Might be a stupid question, but when I launch the game, all I see is a screen with the logo in the middles, notices on the right, and a black roundish rectangular box that reads, “OFFLINE”. How do I get online and start playing the game itself? Not a stupid question at all. If you’ve been trying within the last ~36 hours, then it’s because the servers are offline. They brought them offline on Tuesday evening (my timezone) to migrate them to a different server database. You can find the updates here: http://forums.trovegame.com/showthread.php?87969-Updated-Extended-Downtime-Database-Migration-1-19-2016. Looks like it’s going to take them longer than anticipated. So in about a day, we will get the servers back.